A 1959 graduate of Tucson High School and an alumna of the University of Arizona, Diane excelled in softball, volleyball, golf, and bowling. As volleyball, modern dance, gymnastics, track and speed-a-way Coach at Wakefield Junior High School for ten years, she guided her volleyball teams to 92 wins, including two perfect seasons, and four city championships. 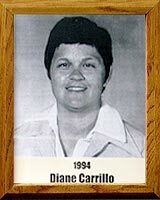 Four of her players were named All American, among her many awards and achievements, Diane was named Coach of the Year (1978) by the Tucson Women’s Sports Association, and was honored as National Principal of the Year in 1991 (NAESP). She has served as Director of the ASA National Softball Tournament, Director of the International Bike Race (Arizona/Sonora) and has been a member of the Hispanic Youth Sports Foundation since 1980. Diane also holds the unique distinction of being the1994-96 Pima County Sports Authority Chairperson in the United States. A dedicated educator and coach, this fourth-generation Tucsonan continues to be an inspiration for countless youngsters in Pima County.